In her delicate watercolors, Angie explores the effect that light and atmosphere can bring to a landscape, interior, or still life. Specializing in miniatures, she finds much of her inspiration in the rural landscape of Lyme. Angie received her BA in Art from Connecticut College. 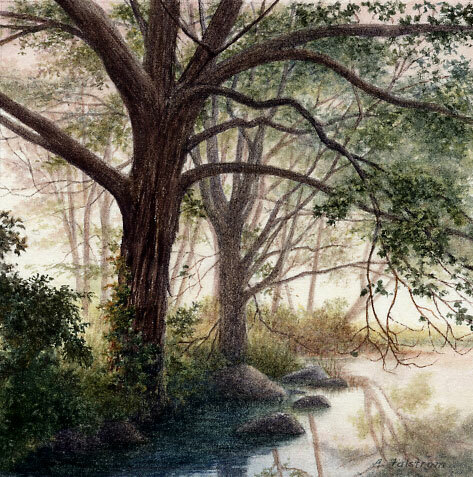 She is an award-winning member of the Connecticut Watercolor Society and the Miniature Painters, Sculptors, and Gravers Society of Washington, DC. Her paintings are have been featured in Watercolor Magazine, and reproduced on cards, prints and calendars through her business, Perennial Designs. She has been an Elected Artist Member of the Lyme Art Association since 1999. You can contact her at: angie.falstrom@att.net.